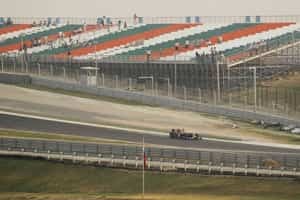 The rhetoric was high at the official inauguration of India’s first Formula One track, the Buddh International Circuit in Greater Noida, nearly 60km from the centre of Delhi. “This (the Grand Prix of India) will erase the shame of the Commonwealth Games," said Jaiprakash Gaur, the 80-year-old founder of the Jaypee Group of companies, which owns the track, and the rights to hold F1 races on it for the next 10 years. “This is about putting India on the world map." The Jaypee Group pulled out all the stops to make sure that the large gathering of journalists called for the unveiling of the track got a glimpse of every corner of the massive racing arena. The medical centre with its compact operating theatre, burns treatment centre, and ICU; the line of pit garages with placards of the teams and their drivers already installed above each garage; the sprawling media centre; and of course, a slow, twisting, ride through the 5.14km track itself. The twists and turns of the track have been well documented, but what will set the track apart from others in the F1 calender are the elevation changes that are woven through the entire circuit, making it more challenging for drivers to retain control of their cars through the high-speed turns. Some of the corners have also been built keeping in mind F1’s parent body Federation Internationale de l’Automobile’s (FIA’s) latest regulations to promote overtaking. Turns 10 and 11, an elevated double-apex combination corner, for example, are wide enough to accommodate five to six F1 cars side-by-side. The approach to this parabolic turn will be blind, and cars will come into the corner at speeds of over 200 kmph. This is the place where the race might be decided. “It’s absolutely world class, no question about it," said Narain Karthikeyan, Hispania Racing Team’s Indian driver. He careened through the track in a sporty Mercedes stock car for a test drive. Despite the readiness of the track, which was further demonstrated by F1 test driver Neel Jani roaring through it in a Red Bull car for the benefit of the journalists, there remains a dust-covered and incomplete look to the rest of the arena, with construction workers still adding finishing touches. There was more rhetoric to counter that: “In an Indian wedding, even though the big arrangements are over, little bits of work always remain," Jaiprakash said, “and here we are talking of 24 brides (the 24 cars in the race), so of course we will have to work till the last minute."